Prime Minister Imran Khan lays on the role of overseas Pakistanis in the nations’ development and invited notable overseas Pakistani professionals to contribute in the making of Naya Pakistan. This was said by the Special Assistant to Prime Minister on Overseas Pakistanis and Human Resource Development, Sayed Zulfiqar Abbas Bukhari , while speaking at inaugural ceremony of “Naya Pakistan Calling” web portal here on Wednesday. In continuation of Prime Minister’s 100 day agenda on revitalizing economic growth, Overseas Pakistanis Foundation (OPF) under the guidance of Ministry of Overseas Pakistanis & Human Resource Development in a landmark initiative has launched an online web portal where overseas Pakistanis will get themselves registered and contribute towards the betterment of the mother land. Federal Secretary Ministry of Overseas Pakistanis and Human Resource Development during his address explained how overseas Pakistanis can register online through OPF’s web portal at www.opf.org.pk. After having been identified as a potential resource, they shall then be involved in the strategic decision making to help steer the country towards progress by placing them as members of the boards of public sector institutions, authorities, commissions, etc. at Federal and Provincial levels. 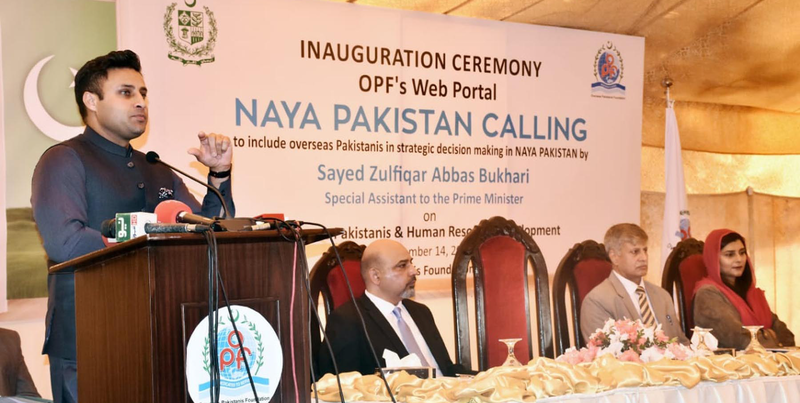 Managing Director OPF, Dr. Amer Sheikh labelled “NAYA PAKISTAN CALLING” web portal as a database comprising of professional profiles of overseas Pakistanis, accessible to all stakeholders. He further added that a country’s diaspora is a huge asset for its economic development and a channel through which not only remittances, but also technical knowledge flows. They are also a potential source of opportunities for trade, investment, innovation, and professional networks.